The Hanover Area Chamber of Commerce delivers value to its members and advances the interests of the business community through various programs, products and services. Interested in marketing? Consider advertising in Chamber Connection Newsletter or Discover Hanover Magazine! Looking for more? Contact Emily Freiert, Marketing & PR Director. For the 15 out of the past 17 years, Penn National Insurance (PNI) has announced dividends for the MAP Program. Collectively, program members have received more than $9.2 million in dividends since the program’s inception. In today’s economic market, it is good to have stability in an insurance partner. 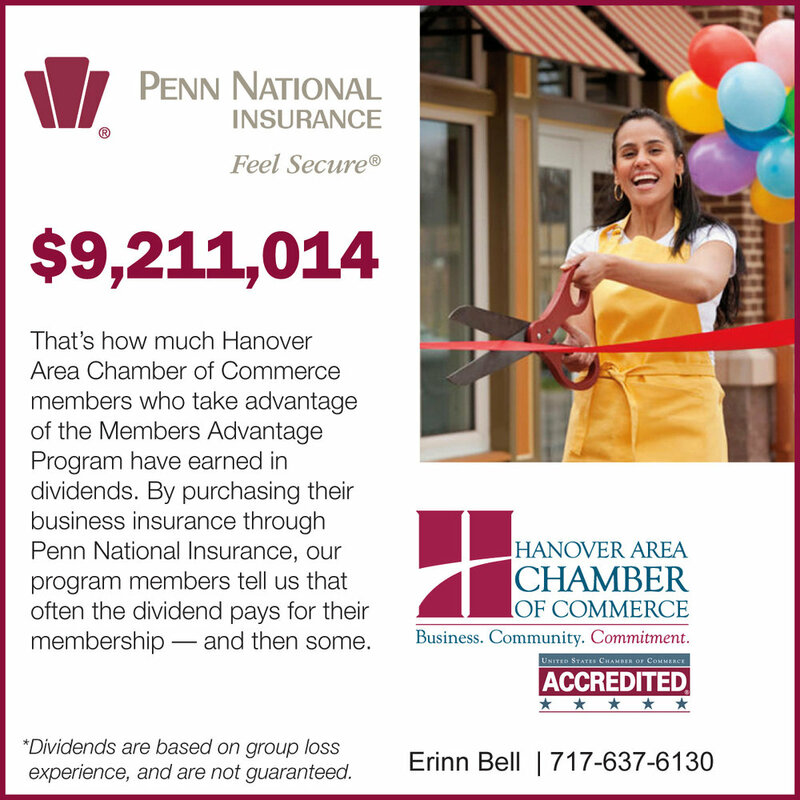 The Hanover Chamber has partnered with PNI for 17 years to bring members a comprehensive business insurance program, and also provide the opportunity for member policyholders to earn an annual dividend. Click here for a list of local agents. StoudtAdvisors is one of the region’s largest agencies focused exclusively on employee benefits consulting, brokerage and administration. By combining the industry’s best talent and web-based technology, StoudtAdvisors delivers innovative solutions to improve the health and productivity of your employees and your bottom line. The Hanover Chamber has enjoyed a partnership with StoudtAdvisors for over 10 years, bringing members a resource that not only maximizes your benefits offering, but invests dollars into our community through a 25% revenue share of broker fee/commission with the Hanover Chamber. For more information about a free consultation for your group benefits plan, please contact the Chamber or call Bri Callahan with StoudtAdvisors at 717-581-6155. In addition to employee group benefits, StoudtAdvisors also partners with SelectQuote to deliver solutions for individual health coverage. For more information go to www.stoudtadvisors.sqbenefits.com or call 1-888-607-2782. Hanover Area Chamber of Commerce has endorsed APPI Energy to provide data-driven procurement solutions that reduce and manage electricity and natural gas supply costs for members on an ongoing basis. Every day, APPI Energy identifies the wide range of energy supplier prices across the U.S., and the lowest prices available among many vetted, competing suppliers. To take advantage of this membership benefit program, contact Carrie Shepard at APPI Energy at 667-330-1167.